Traumatic brain injury (TBI) is a neurological disorder that affects more than a million Americans. Additionally, TBI in the combat environment is a major cause of morbidity and mortality in recent armed conflicts. However, TBI is very difficult to diagnose and, therefore, to treat. UVA’s own Dr. James R. Stone is actively working to improve the clinical diagnosis of this disease process by creating an image library of three thousand healthy adults to serve as a reference when diagnosing TBI. Dr. Stone is Vice Chairman of Clinical Research and Associate Professor of Radiology and Medical Imaging. 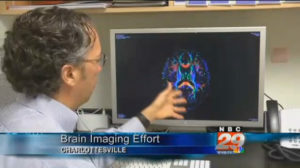 His work and the work of other UVA professors in radiology contributes to a national effort to better understand TBI. To hear more about this effort, check out this video.